We have a lot going on in the morning and the boys are always curious to what the day has in store for them. 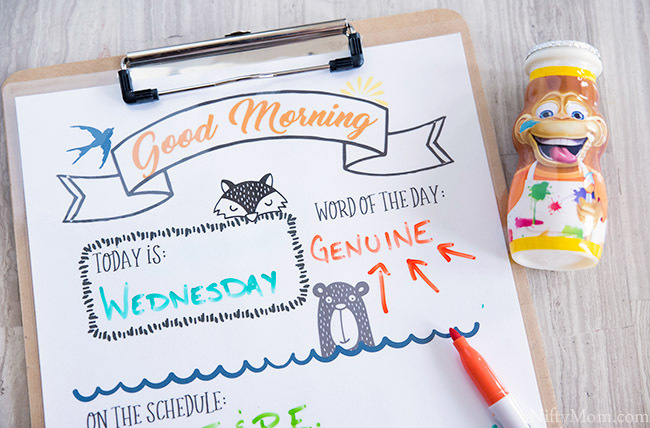 I created this free printable kids morning sheet to help our morning routines and motivate the kids along the way. 2 weeks. We have 2 weeks before school starts. That may seem like just enough time to get everything done and ready, but then throw in a super awesome vacation right in the middle of that. EEK. 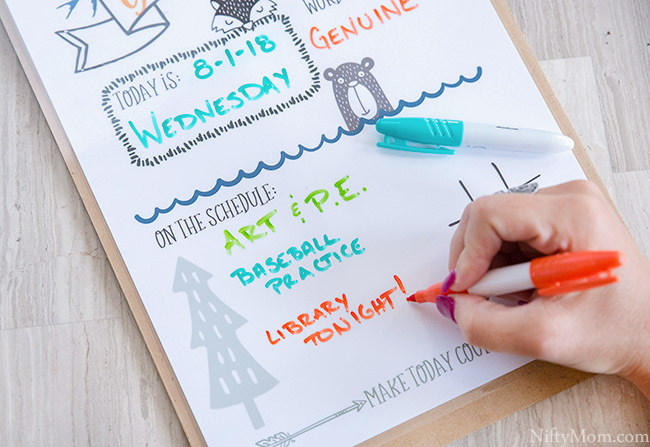 As excited as I am to be going to Punta Cana with my husband to celebrate our 10 year anniversary next week, that means crunch time for back-to-school prep. This week is the time we start adjusting our daily routines to that of a typical school day. That way the kids are waking up on time and it is almost the norm again. Last week I purchased most of the school supplies needed and then it was on to groceries. I have to stock up on more things for their lunchboxes and snacks. 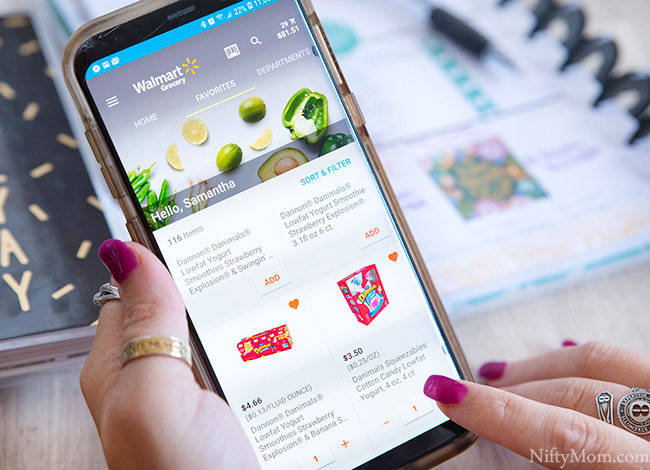 The easiest way for me to do that these days by using Walmart’s Online Grocery Pickup service. It’s easy and super convenient. I can things to my app as we run out, finish my order when I am ready to schedule a pickup time, and pickup them up without getting out of the car. Busy mom time saver, no doubt. It has saved me many times. Since we will be out of town next week, I need to get the refrigerator stocked now. Our refrigerator has four doors, and the kids claimed one of the bottom sections as their own and when it is getting empty, that is not good. Their door is where we keep their snacks, drinks, lunch foods, etc. 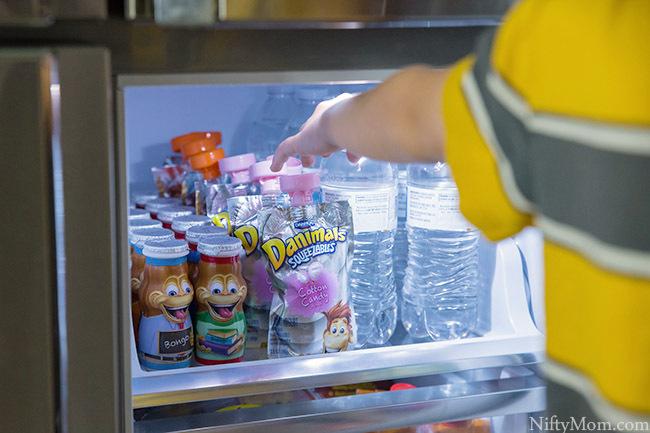 Dannon® Danimals® products occupy half a shelf, as you can see. The smoothies and pouches are nutritious snacks I feel good about feeding my kids, as they are a good source of Calcium and Vitamin D with no artificial flavors. The sizes work great for breakfast, snack, lunchboxes, after school and anywhere on-the-go. Because of that, I stock up on them weekly. With three kids, it doesn’t take long to run out. It’s the Delicious Taste Kids Love. Especially when they want one at different times throughout the day starting at breakfast time. Speaking of breakfast, that can be a pretty hectic time when it comes to school days. Since we are getting into our school routines now, I have been coming up with things I think will help with the craziness. Every single day before school last year, the kids always asked what day it was, what classes are on that day, what we had scheduled after school and anything else they can think of. To help get them excited and answer those questions before they even ask, I created a morning sheet. I printed one for each kid on cardstock and laminated them so I can reuse them daily. I decided to keep ours on clipboards so I can add things they need to take to school or we need to remember to fill out. Date – A place for the date and day of the week (they always ask even though we have calendars all over the house). 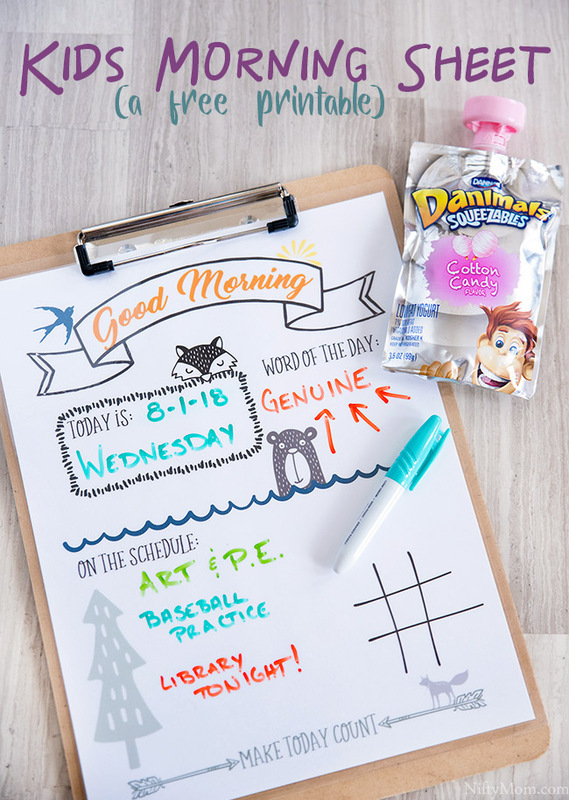 On the Schedule – This section is for anything we have planned for the day or I think they will look forward to during school. 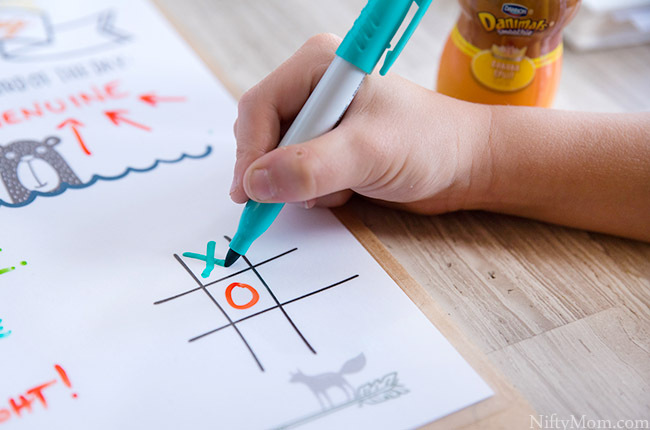 Bonus – There is a tic-tac-toe grid for the kids to play. I fill out each sheet before the kids wake up (or the night before) so they are ready for breakfast time. Then during breakfast they can read it, play tic-tac-toe, talk about the word of the day, etc. While they are doing that I am making sure everything is ready for school and lunches are packed, if needed. 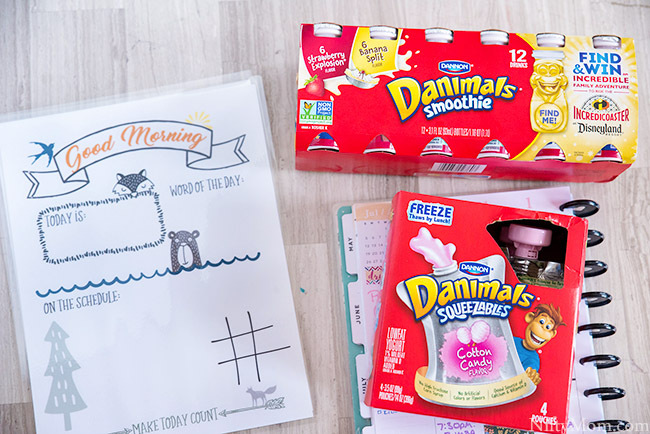 If the kids are indeed bringing their lunch to school, I typically pack a frozen Dannon® Danimals® Squeezables Cotton Candy Lowfat Yogurt pouch. By the time lunch rolls around, the pouch is thawed! However, while the Danimals® smoothies need to stay cooled and/or refrigerated, it should not be frozen. 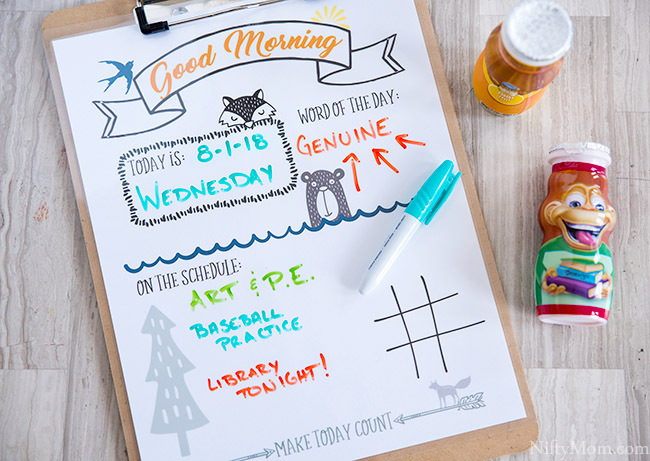 If you are stocking up, Danimals® wants to help your kids start the school year off right! 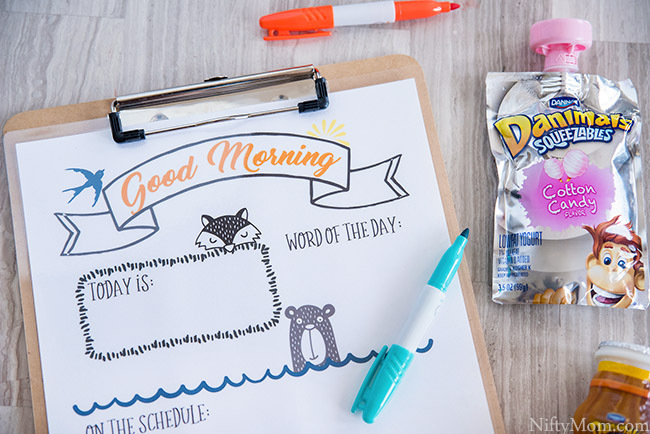 Right now when you buy 3 participating Danimals® products, you will receive a $10 gift card for school supplies on walmart.com! Get this great offer here through October 15, 2018. 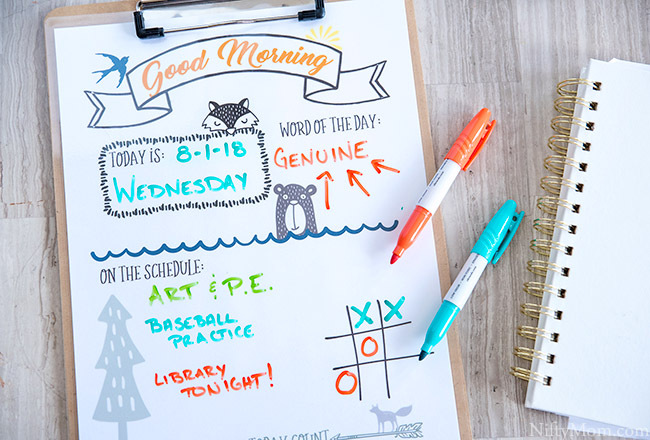 How are you getting ready for back-to-school?